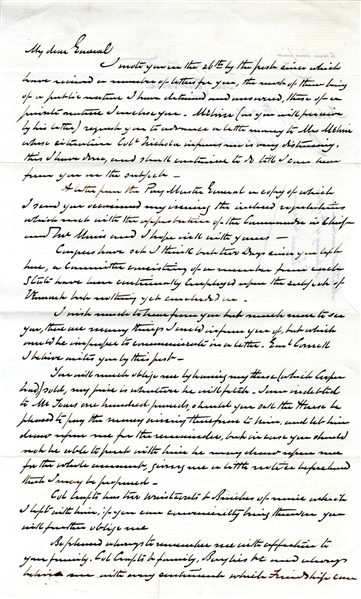 19th century copy of an letter by Matthew Clarkson (1758-1825) Addressed to General Benjamin Lincoln, 1-1/4pp. folio, February 4, 1782, and reads in part: “...Congress have set I think but two days since you left here, a committee consisting of a member from each state have been continually employed uppon the subject of Vienna have nothing yet concluded....” More. Very good condition. Matthew Clarkson (1758-1825) was a colonial soldier and politician. Clarkson Street in Greenwich Village and the town of Clarkson in Western New York were both named after him. When the war ended, Lincoln became Secretary of War and Clarkson became his assistant. He served as a Federalist member of the 13th New York State Legislature in the New York State Assembly for one term from 1789 to 1790, where he introduced a bill for the gradual abolition of slavery in the State.